There used to be a certain dread when checking-in at Gatwick (LGW) writes Jane Stanbury. As the desk loomed, the heart sank at the endless lines of suitcases, people and cabin bags. The representative from Elixir Holidays, a luxury Turkish tour operator specialising in the South Eastern region, welcomed us. The brand new Mercedes Viano whisked us to our hotel, The Doria, one of the 10 eclectic boutique hotels in their portfolio. 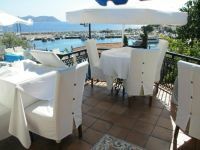 The contemporary 10-bedroom property sits next to stylish Kas, pronounced ‘cash’ marina, and seemingly floats above the sea. The spacious, sumptuous deluxe room has impossibly high ceilings with décor that lends an ambience of light and space. Two of the walls are actually floor to ceiling windows with one posting picture perfect views across the bay to the Kas Peninsula, whilst the other leads to a terrace incorporating a Balinese style day bed and private deck from which to dive into the crisp Mediterranean water. Some of the terraces also feature a Jacuzzi. If the sea is not your thing then a huge infinity pool sits next to the man-made beach. Here powerful massages are given in a shady cabana by a tiny Balinese therapist. Sunset cocktail hour is a must- they are truly impressive concoctions from an endless list. At night the poolside bar morphs into a romantic dinner location with twinkling candle lit tables welcoming diners to a touch of Turkish romance. The menu includes international, Turkish and Ottoman influenced dishes along with fresh fish. With a breeze from the sea, and a short stroll back to your room it’s hard to beat. Managed completely by the Elixir Group, service, led by Mehmet and his team, is always with a smile and a genuine desire to please, nothing was ever too much. If you can drag yourself away, a short walk through the marina brings you to the heart of Kas in about 20 minutes. Possibly one of Turkey’s best-kept secrets Kas is a small harbour town equidistant between Dalaman and Antalya. It has resisted over-development and retains a gentle hum of activity, tempered by a mellow atmosphere throughout its narrow, cobbled streets. The harbour is the hub and the spokes of the streets lead to restaurants, boutique shops selling everything from carpets to spices, and a plethora of companies offering adventure sports which abound with parasailing, diving, canyoning, rafting, sailing, hiking and many other activities all within a short drive. For food lovers mezze menus are available from meyhanes (taverns) offering familiar Turkish delights including hummus, baba ganoush, meatballs, kebabs, fresh fish and seafood, and less familiar dishes including weedy fish – samphire, börek – flaky pastry cheese and parsley rolls, mücver – courgette fritters and manti – Turkish ravioli. Accompanied by Reki, the local aniseed flavoured aperitif, served with ice and water, tingles the taste buds. Foodies will also enjoy the fine selection of restaurants around the town. Popular favourites include Ikbal, serving the most tender lamb dishes around on a quiet vine covered terrace; Bijout lives up to its name. Four sit in the front garden of the house where the small, but perfectly formed menu, is prepared fresh each day in the house kitchen, the food is international but with a Turkish twist; The Blue House has harbour views and serves amazing hummus with pistachio nuts and the freshest fish dishes around. For a slice of real Turkish fare try Zaika Ocakbasi where a commitment to reproducing Persian dishes is obsessive. The service everywhere was delightful, the food delicious and proves there is a depth to Turkish food not epitomized by the ubiquitous doner kebab. Kas is situated in historical Lycian heartland, making it ideal for exploring this fascinating ancient civilization. An hour’s drive from The Doria, through agricultural plains, covered in thousands of poly-tunnels, brings you to the Xanthos Valley. It is home to some of Turkeys’ most impressive archaeological sites. Xanthos combined with its sister city Letoon is regarded as one of the best and is rightly listed as a UNESCO World Heritage site. It was the capital of Lycia for most of its existence with excavation revealing its origins to be eighth century BC. Most of the ruins have been excavated but many still lie beneath vegetation. Even so, it is breathtaking in its splendor; wondrous in its size yet is wrought in violent history. Defending their people from invaders the Xanthosians demonstrated their fierce independence when they chose to commit mass suicide rather than submit and set fire to their women, children, slaves and possessions before leading their final attack. In addition to the expected features, an acropolis at the tallest point, an amphitheatre mainly now occupied by goats, an incredibly well excavated central-street and of course Turkish baths, Xanthos has some pretty unique features. 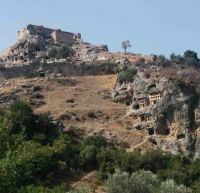 The only Lycian two-tombs-in-one burial chamber is found here; along with the Xanthian Obelisk dating from the fourth or fifth century it is engraved with the oldest and longest Lycian inscription known to man. There are even remnants of the ancient water pipe system. Further along the valley Tlos seems invincibly perched upon a steep escarpment. Its singular most identifying feature, sitting beneath an imposing acropolis, is a collection of burial tombs impossibly carved into vertical rock faces. Here the residents would be laid to rest facing out across the valley. As the bodies crumbled they were swept to the back of the tomb and replaced by descendants. Unusually this was a two Turkish-bath town. The “large” bath is an individual edifice consists of three equally good sized rooms with an apse giving on to a panoramic view of the lush Xanthos valley through seven columns, whilst the “small” bath is attached to a hall complex. The impressive amphitheatre dominates the skyline and an expansive stadium seating up to 2500 people was used for sports and municipal events. The ease of access to all the ruins gives visitors a lasting impression of the occupants’ lifestyle. It’s a magical location with an atmosphere steeped in history.